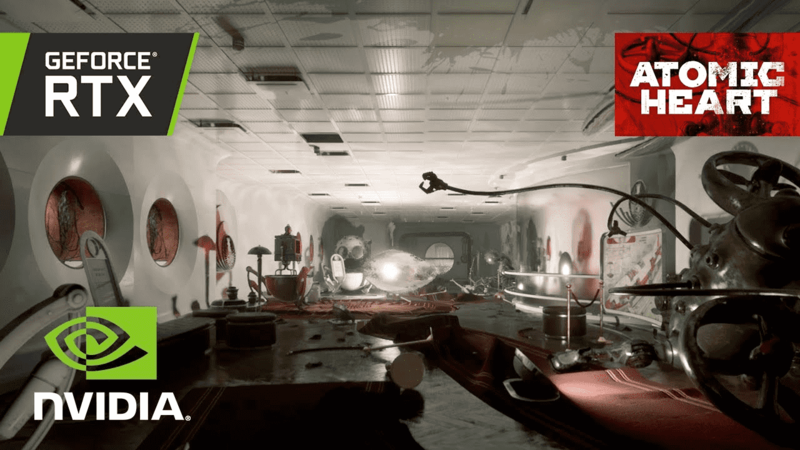 The Atomic Heart tech demo is a beautifully detailed demo from Mundfish that features ray traced reflections and shadows, as well as NVIDIA DLSS technology. The addition of NVIDIA RTX Ray Traced Ambient Occlusion, Reflections and Shadows transforms the look of scenes, adding a massive amount of detail that accurately mirrors the properties of materials and the surrounding world. Most noticeably, Ray Traced Reflections add accurate, real-time reflections to Atomic Heart's curved objects and surfaces, to its super shiny labs, to its water, and to numerous other game elements. Previously, reflecting much of this detail was impossible, and what could be reflected was seen at a far lower level of fidelity, without accurate representation of curved surfaces, or real-time updates of on and off-screen reflections.